Light makes a dramatic impact on the appearance of a bubble in water. Some bubble walls receiving direct sunlight may not require a light, however lights are recommend for almost all indoor bubble walls, especially in low-light locations and night time viewing. Our basic lighting is white lights. 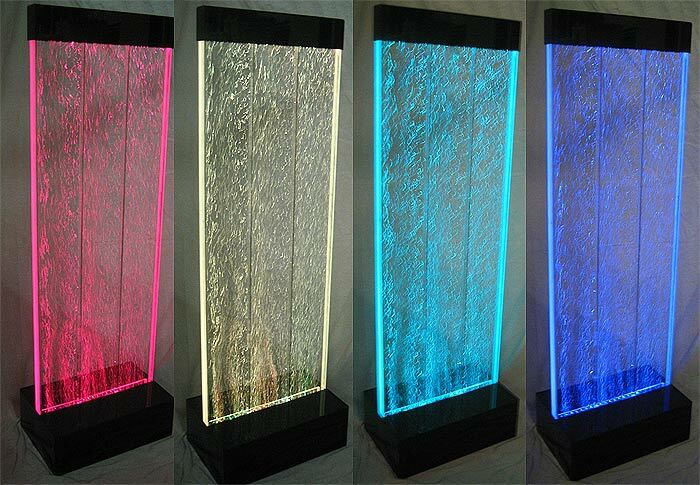 Depending on the size and shape of the bubble wall, a variety of lights may be used: fluorescent strips, halogen or LED spotlights, fiber optics, neon, etc. Most of our bubble walls feature frosted edges, which glow when the lights are on. Edges can also be polished clear, providing direct view of the bubbles, however the frosted edges have a warmer feel and the glow highlights the panel. Note, this is only for bubble walls which have a portion of the tank visible. Some styles of frame may completely cover the edge of the water tank. However, we may also add edgelights and fiber optics to other frame elements for more effects.